Spectrum Mobile uses the Verizon network for their coverage nationwide. Since they use the Verizon Wireless network you should have solid coverage in almost all areas of the United States. 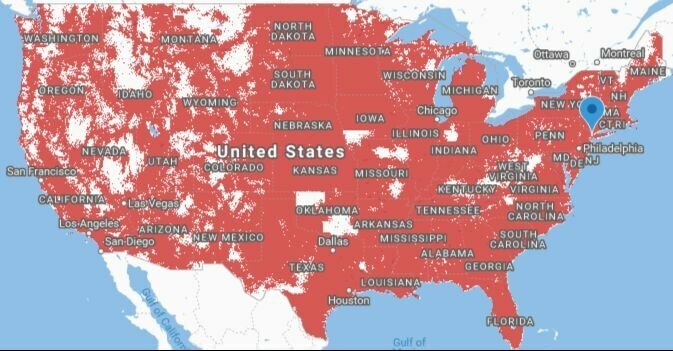 As you can see on the map, there are very few metro areas that don’t have coverage with Spectrum Mobile. If you have good service from Verizon then you should also have good service with Spectrum Mobile since they run on the same network. This also means you can easily bring over any phones you used on Verizon. According to their website, they cover 98% of the population with their LTE network (Verizon Wireless Network). Leave us a comment below if you have any questions about the Spectrum Mobile coverage map and network. Also, if you’re a current customer let us know what the coverage is like in your area along with city, state, or region. If I take my phone overseas will it work for me. I found this on their website and it may help answer your question. I would say that you’ll still be able to use your phone overseas, but it doesn’t give any information on what the costs are. I would guess it would be much cheaper to purchase a SIM card or plan for the area you’re in if you’re going to be there any amount of time than to pay Spectrum Mobile’s international roaming charge.